Madagascar has long been a destination we have wanted to include in our programme such is the diversity of totally unique species to be found there: lemurs may be the first that come to mind but chameleons and an array of other rainforest life offer a dazzling diversity. Visiting 6 reserves over 16 days we will get the best chances possible to experience this diversity with expert local guides and trackers where beneficial too. Des’s experience working here also means we have strategically chosen hotel locations and streamlined our travel routes to minimise the journey times between locations where possible so that we can enjoy the maximum that this majestic island has to offer – Mousel lemur, Indri, Giraffe-necked weevil, Satanic Leaf-tailed Gecko: even the names are enough to wet the appetite! Day 1: Depart UK/Europe for flights to Antananarivo, Madagascar. Upon arrival, you will be met and collected from the airport, and transported to your lovely overnight accommodation close by. Day 2: We will take a flight heading south, where you’ll be staying at a hotel near the sea. We have planned a short trip to a botanical garden not too far away to practice on some tame Lemurs, living on a small man-made island. The endemic Madagascar Malachite Kingfisher is sometimes seen perched by the water’s edge. Day 3: After breakfast, we will continue our journey south by car. We will be passing through some small villages and local markets, giving us a glimpse of the native culture. We will eventually arrive at a private nature reserve, set in a landscape that resembles another planet – bright red earth surrounded by alien-looking architectural plants. At dusk we will head out for a night walk at the gallery forest to seek out some of the nocturnal species that inhabit this environment, such as the Madagascan Scops Owl. Day 4: From early morning until night, we will have numerous walks to explore and record the many fascinating wildlife with the help of our specialist guides. Amongst them, we will see several species of Lemurs, birds, chameleons, scorpions and fruit bats. Some of the highlights include the ‘Dancing Sifaka’, and a visit to the unique spiny forest – a very special habitat with fascinating flora and fauna. Day 5: After a good night’s rest, we will have our final breakfast at the restaurant – do watch out for the croissant-stealing Ring-tailed Lemurs though! We will then drive back to the airport to catch a flight back to the capital city where we will spend an evening at the hotel. Day 6: We will drive east to a small community run rainforest reserve. To help break the long drive, we will stop by a reptile farm along the way where we can see, and photograph a few species that exist in Madagascar, such as the miniature Leaf Chameleons. This opportunity complements our encounter of wild subjects with those from regions we do not cover on this occasion. We will finish the day with a visit to an orchid park showcasing some of the native species. In the evening we will go for a night walk looking for some of the nocturnal species such as Mouse Lemurs and amphibians. Day 7: We will devote the entire day to exploring a prominent national park looking for wildlife and flora to photograph, such as the critically endangered Diademed Sifaka. During sunset, we will have another night walk in search of nocturnal subjects. Day 8: After breakfast, we will visit yet another national park nearby. 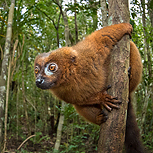 While smaller, this special reserve supports a great many species, including the largest of the Lemurs, the Indri, beautiful Red-bellied Lemur, and the adorable Grey Bamboo Lemurs. After lunch we will drive to the edge of a vast freshwater lake for an enjoyable boat ride to the private reserve, where we will be based for the next two days. Days 9-10: We will have the opportunity to explore the surrounding forest where it holds some truly unique animals and plants, such as hybridized Lemurs, tree frogs, Pitcher plants and many more. After lunch you will have some personal relaxing time in the afternoon to enjoy this beautiful location. Each day will end with a visit to a special island at dusk to see the most bizarre of all the Lemurs, the Aye Aye. Although challenging conditions, with careful instructions from me you should be able to photograph this truly incredible looking creature during our two visits. Day 11: After breakfast, we will leave this beach resort by the lake, and catch another relaxing boat ride back and onwards to the city for an overnight stay. Day 12: Today we will head in a southerly direction to an elevated city 1500m above sea level. In the afternoon we will visit a scenic lake and a traditional Merina village, before settling in to a very quaint boutique hotel. Day 13: This morning we will continue southwards to our final destination, a cloud rainforest. The temperature here will be even cooler than those we’ve previously visited due to the altitude. We will begin with a night walk at dusk looking for species found in this region such as the Nose-horned Chameleon and the Bright-eyed Frog. Day 14: We will spend a full day discovering the many diverse flora and fauna that live in this beautiful forest. Passing over impressive waterfalls and streams, we will hope to see wildlife such as the Golden Bamboo Lemur, Milnes Edward’s Sifaka, chameleons and the Satanic Leaf-tailed Geckos. After a picnic, we will take a short drive to another location to search for other interesting species such as the Giraffe-necked Weevil or the brightly coloured Mantella frogs. The day will finish with yet another enjoyable night walk discovering more nocturnal species. Day 15: After breakfast, we will have a long drive back to the capital city, passing scenic mountain terrain with rice terraces, stopping half way for lunch. Day 16: Depending on our flight schedule, we will be taken to the airport to catch our homeward flight and we will arrive in the UK on Tuesday 17th September. Accommodation, all local transport including internal flights, entry fees, and all meals. All international flights, sundry items and alcohol. Our accommodation throughout is clean comfortable local hotels. Food is of an Asian style in terms of general influence. Most of the treks are not strenuous although the heat and humidity might be uncomfortable for some. We could walk up to several miles a day but this will not be continuous as we will be stopping along the way to photograph different subjects. The terrain is generally flat but uneven but there will be some hilly areas.